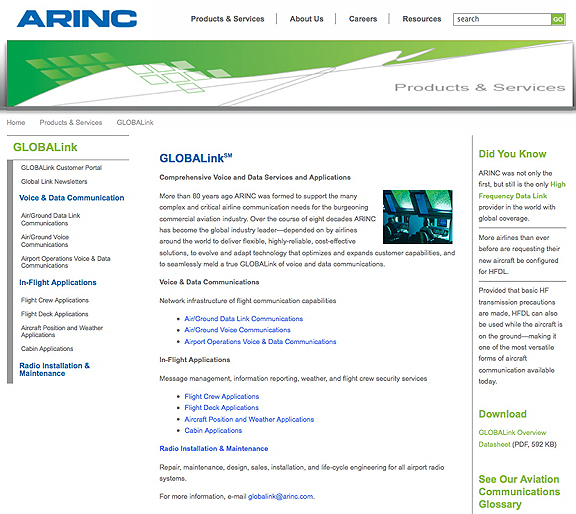 SatNews — ARINC Incorporated has deployed three new GLOBALink(sm) remote ground stations (RGS) to support aviation data link communications services in New Zealand. The launch of GLOBALink coverage will enhance in-flight data transfer and communications between airline operations centers and aircraft flight decks. The new ground stations were successfully installed at Auckland, Christchurch, and Wellington with the support and cooperation of AeroThai, ARINC’s regional communications partner, and Airways New Zealand, the country’s Air Navigation Service Provider. In addition, the VDLM2-enabled ground stations have the capability and capacity to support increasing datalink requirements in the future. Airways New Zealand has agreed to maintain and manage the new data link ground stations. With the addition of New Zealand, ARINC’s GLOBALink network infrastructure in the Asia/Pacific region has now expanded to more than 150 Remote Ground Stations located across 12 countries, including China, Japan, Vietnam and Thailand. Data link enables air crews to communicate and exchange information with ground crews and airline host systems anywhere in the world without interruption. Compared with voice radio communications, data link improves flight deck processes and increases efficiency. It provides clear, accurate, unambiguous operational messages directly to the crew, via either a cockpit display or a printer. Data link also stores messages, so flight crews can review and verify instructions.